My Two Plus project is going quite good. 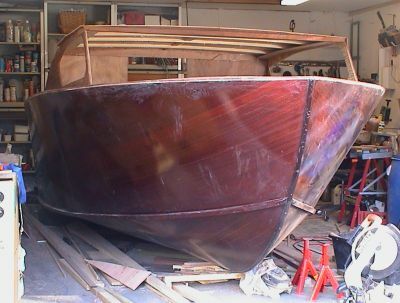 After putting the plywood on the frames I thought the hull looked so nice that I really wanted to create a mahogany cruiser of this boat. I found a local supplier of Khaya mahogany. 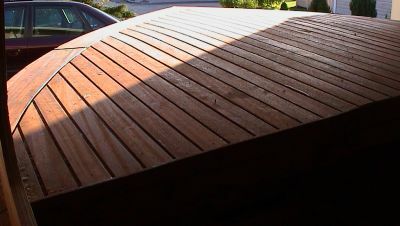 I ordered 6mm thick and 45 mm wide strips that had bed and cove as in strips used for strip planking. This in some ways made it easier to glue the strips to my hull. But I found that in the areas near to the bow these strips where a little too wide to be used with bed and cove. Very difficult to get a tight fit. Some areas don't look as good as they should. 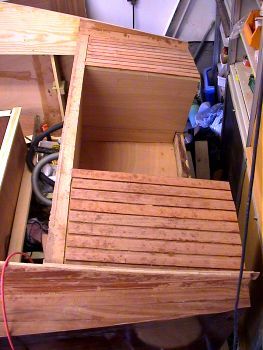 I also had trouble finding a staple gun that was able to make the staples penetrate the mahogany. I don't know if the wood I've used is any harder than average. But even an electrical staple gun of top quality couldn't do the job properly. I ended up with using nails in some areas. They of course made some not so pleasant looking holes when pulled out. These were frustrating times, and I started to hate sticky epoxy and staple guns. When sides and front part of bottom were finally covered and the epoxy cured. I cut of most of the epoxy drippings with a power plane set to zero level. This actually worked fine. It only removed the "tops". This was followed by hours and hours of sanding. I used a disk sander. The result was quite good. My mahogany supplier advised me to stain the wood before any surface treatment. So I mixed a custom colour of water based stain and applied it with some old T-shirts. I then covered everything in three layers of epoxy. I used glass cloth for the bottom section only. Time will show if this was a good idea. Just before Christmas I called for a truck with crane to help me turn the hull over. He handled this operation very efficiently. No scratches occurred. The guy was so amazed by the project that he didn't charge me anything. Turning the hull over was a fun milestone. I now had a boat. And the process of completing it could start. From January until now, I have averaged about 6 hours every week. Progress is a little slow. But decks are in place as well as the main cabin structure. I had plans for getting it in the water this summer. But there is still a lot of work to be done. So for the moment I don't have a final schedule. I just keep working as much as I can, knowing that this will actually become a boat some day. I think it will be a very nice one too.